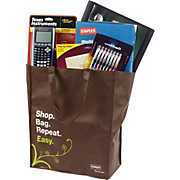 Click here to visit the Staples site and you’ll be able to print a coupon good for a free Eco Bag + 20% off everything you can fit in it @ Staples. Just take the coupon to their service desk to get your bag, shop around, and then bring it to the register. The coupon includes ink, chairs, furniture, and clearance items, but there are some restrictions, so be sure to check the coupon for details. Coupon is good until 6/22.